Thanks for posting your car and telling about it! Nice Dart-I had a yellow one that I loved many years ago. Must be fast with a 383.
a '67 GTS? thought that the GTS started in '68? lucky you to have such a cool car. 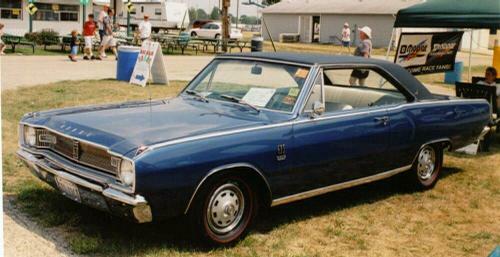 my first car was the '67 GT. my last chrysler product was the very last new '74 'CUDA. i didn't know then what i know now. good for you for being so wise. I'm looking for the clips to fasten the moldings to the top of the fenders and doors. Anyone have these parts? Please e-mail me at Strkr69@aol.com if you know where I could pick some up. Thanks jim This the last pieces I need to Put Another GTS back in service. What would a 67 gts be worth?? ?